Planting the deck always starts out innocently enough but then degenerates into a huge project. This year was no different in that respect, and to even get started with the ritual power washing all the winter debris of kid-play and kitchen remodel-scraps had to be dragged off first. 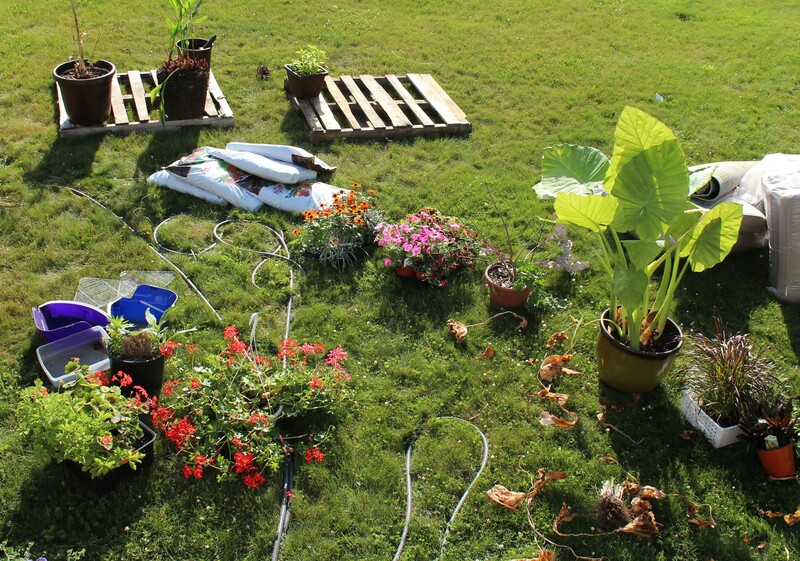 So hauling off trash is the first project, then the cleaning, then the decision that all the mishmash of geriatric plastic planters should match, so off for a paintbrush and some leftover paint. No more black nursery pots, or old teal and faded gray, all the plastic was painted with my trusty mocha-tinted, all surface Sherwin Williams paint. Our last frost date is around the 15th of May, but most planting jobs are usually procrastinated way beyond that. This year the big deck planting was pushed off until June 8th, which meant a lot of sitting around for the earliest purchases but it also meant clearance sales were in full swing. So this is where the ‘meh’ comes in, and since the weather is kind of ‘meh’ today as well it might be the best day to discuss… I usually go out with little to no idea or plan and as a result come home with whatever catches my eye. Usually it works out, but this year I just feel like something’s missing. Maybe I need yellow, maybe it’s the lack of sweet potato vines, maybe there’s too much red, maybe it’s the pink… I’m not much of a ‘pink’ person. One purple fountain grass is nice, three might have been overkill, still the rosemary enjoyed its division and replanting, and most other plantings are hanging in there. You may notice my amaryllis bulbs tucked in here and there. The strappy leaves don’t look half bad in my opinion. I should be giving things a nice liquid feeding each week and part of the ‘meh’ might be that things are underfed. A rich diet for these flashy annuals is what they thrive on, and upon thinking back it’s possible I’ve missed four out of the last five feedings. As usual I’m my own worst enemy. 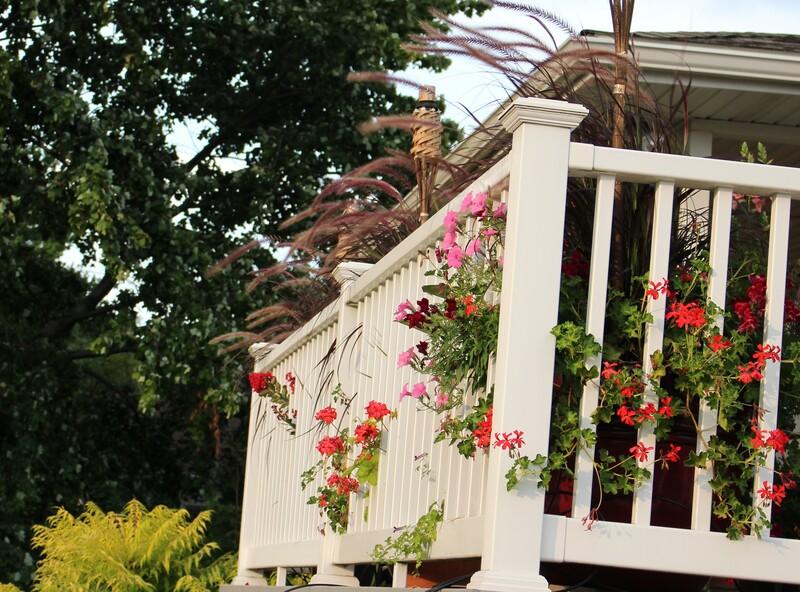 I do like how the creepers, in this case cascading geraniums (pelargoniums), work their way through the railing. They’re very popular with the hummingbirds even if the color might be a little too orangey for the companion plantings. Some other disappointments have been the underperforming vines. My three little babies, the Chilean Glory vines (Eccremocarpus scaber) did not take off as planned. Apparently they are foolproof but this fool will challenge that label since my plants (nurtured along from tiny seedlings) made a go at it but then died off one by one. I did get to see one single bloom cluster of amazing little orange lipstick tubes of color but that was it, and I think if I was brave enough to beat back the grasses, I would find my last glory vine has also passed over. That’s too bad but I’m already excited to grow this plant again next year since I’m sure things will go differently even if I do everything exactly the same… but in the meantime at least my snapdragon vine (Asarina scandens) is coming along. 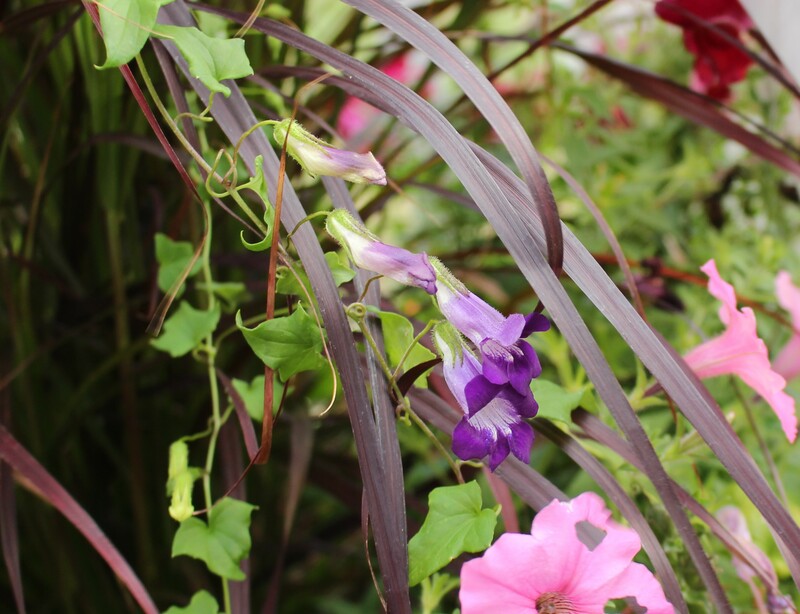 Snapdragon vine (Asarina Scandens) growing up into the purple fountain grass. At least this one has been a forgiving grower and easy bloomer. While many of the plantings leave me uninspired, a few things are doing great. The oleander and overgrown spikes are back for another year and the canna ‘cannaova rose’ is again putting on a nice show. The canna just hit a lull (probably lack of fertilizer induced) but I’m sure will return to glory shortly and I’ve divided last year’s roots up between a few spots so it’s likely you’ll see these showing up elsewhere as well. There are a few new things this year which did beat the ‘meh-ness’. 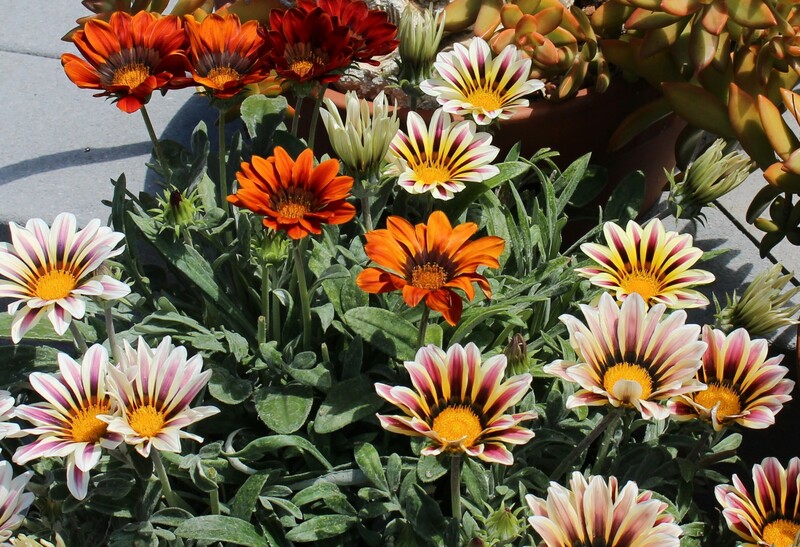 Gazania are a plant which although they don’t grow consistently for me, do look great when they feel like it. By the way I forgot about the elephant ears and the new crape myrtle, both of which are not ‘meh’. The two are just soaking up the rain and heat and humidity and picking up where the petunias and million bells drop off, but before I begin to sound too positive let me point two things out. First I have too much red, and since the obviously red myrtle was labeled purple I’m innocent there. Second there’s a plant missing out of the small terra cotta pot in the front of the photo. There’s a cute little b***ard chipmunk who decided it would be fun to end my three year relationship with a slowly growing clump of lithops (living stones). After a few days searching I found the chewed up corpse under a nearby shrub. Time will tell if the shriveled bits can recover, my only hope is that they were poisonous. 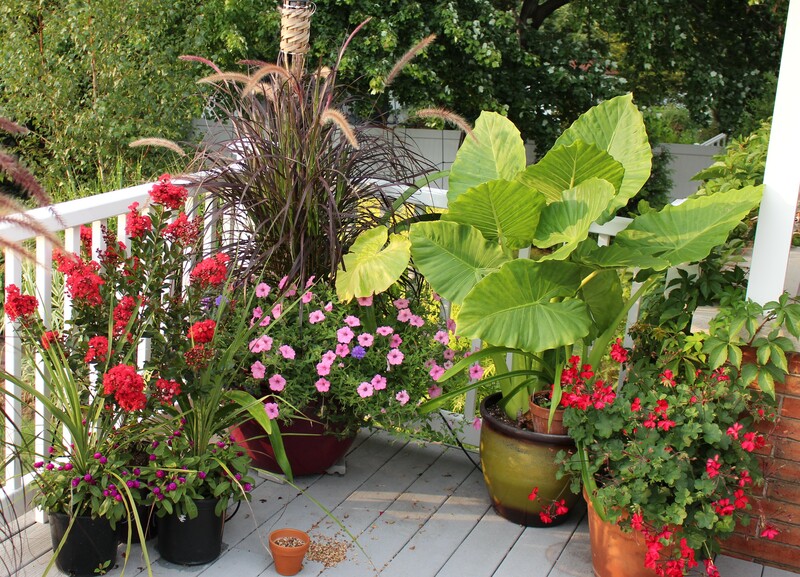 Blood red crape myrtle and geraniums, pink ‘bubblegum’ petunias, elephant ear (Alocasia calidora? )… an ‘interesting’ look I suppose. I still need to mention the digiplexis which just came into bloom this week. 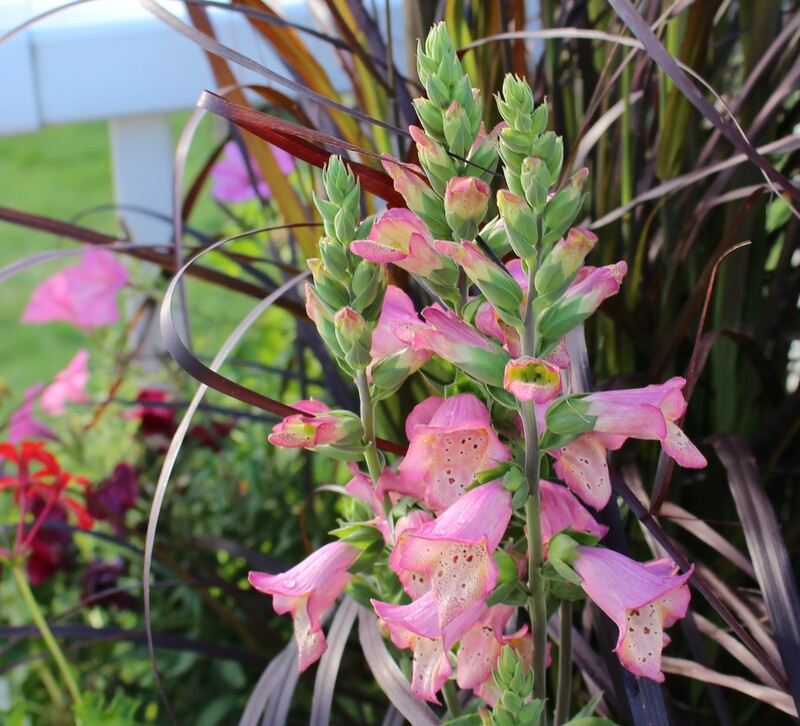 It’s a inter-species cross between a foxglove (digitalis) and an Isoplexis (Canary Island foxglove) and when it first hit the market in 2012 it immediately went on to many ‘must have’ lists. My must have list is always a few years behind but I was finally able to try it out this year when I found it for a reasonable price. Digiplexis ‘Canary Berry?’. It’s nice enough but I’m not overwhelmed yet. It’s one of the foxgloves, and I love a nice foxglove, but this non-hardy version might be something left for those everything-grows-for-me San Francisco gardeners who have super mild winters and cool nights which bring on stronger colors. So there’s good and not-so-good out there and to be honest no matter how it looks it always beats the deck in January. January seems to keep all gardening outcomes in perspective and as I check things out every day and multiple times a day I’m still happy with it. Now if only I could get out there and fertilize, but the lawn needs mowing too and I’m not doing both until things cool off a bit. 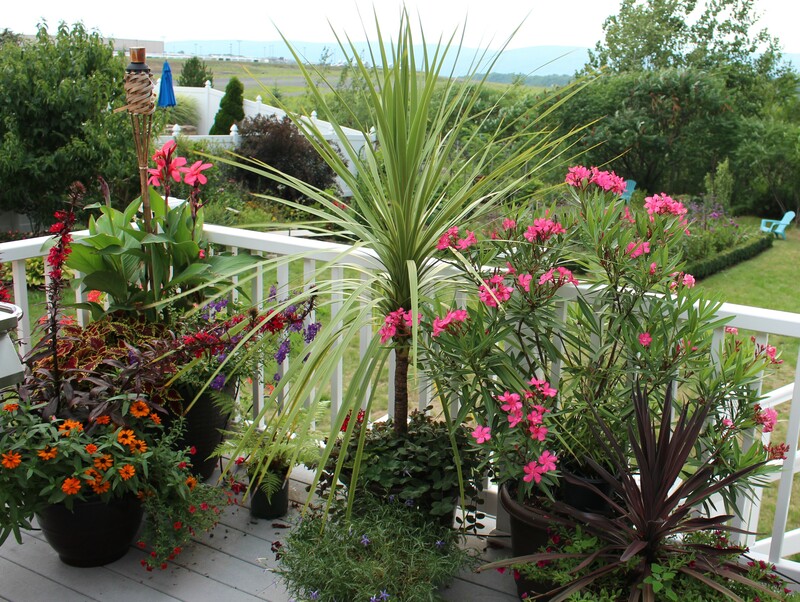 This entry was posted in annuals, deck plantings, garden design, summer, Uncategorized and tagged annuals, container garden, deck containters, flowers. The plants all look well grown to me. I don’t know what your “meh” is about. Bonus points for painting the containers a consistent color. My cannas seem to be treading water. I swear the ones in the ground haven’t grown an inch this month. I thought they would be taller than me (5’1″) by now. Thanks Kathy. Must be my mood today. Now should be when your cannas explode, I can’t imagine what’s wrong with them. A few of mine sulked through the dry spell, but the rain has snapped them out of it. The good thing about annuals is you get to do something different every year, so there’s always next year. From my POV, your deck looks lovely. This is the first year I put Osmocote in my planters and I am SOLD on that idea because the plants look so good. Like you, I couldn’t keep a fertilizer schedule to save my life and come August everything looked it. You mix it into the soil before planting and then you can forget fertilizing for at least 3 months, which is all the growing season we have anyway. I had some Osmocote in my hand a few days ago. It was on clearance and I thought it would be perfect but then scolded myself for not just fertilizing regularly. Maybe I’ll pick it up tomorrow, it sounds like it’s really worked well for you and my neighbor swears by it! I use Osmocote in my containers and as a start for vegetables too as I never fertilize again after planting although I have been feeding the lemons this year and they look so much better for doing it. 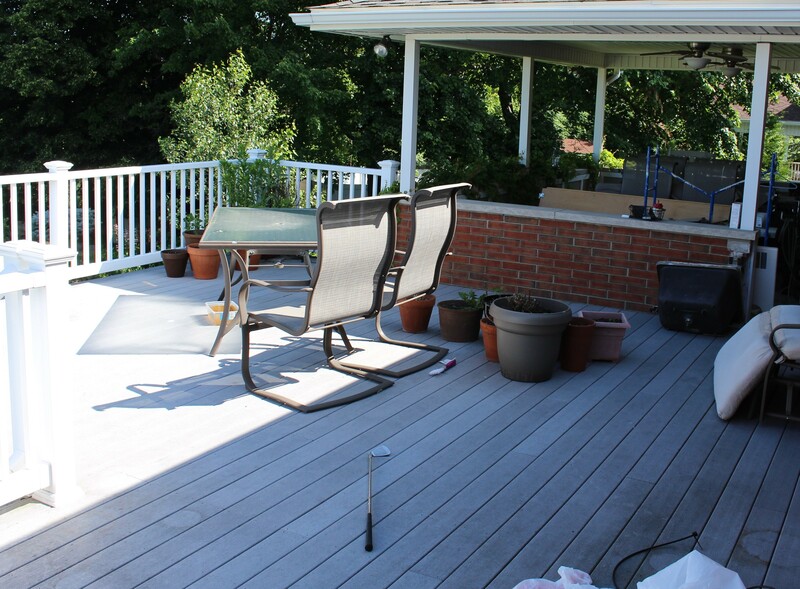 I think your deck looks great and inviting and not too much red at all! Red is a nice color, and over here it does attract the hummingbirds which are worth overdoing a color for. I will give the osmocote a try, I would have done it sooner but it seems fairly expensive. I guess I’m not considering the once or twice a year perspective in which case it’s very reasonable. Well I think it all looks lovely and must be a pleasurable place to sit in the evening with a cold drink. 😉 I always have great plans for my summer annuals, but then can’t find the plants I want and end up with a mishmash in my shopping trolley. I did manage to concentrate on Pelargoniums this year as they withstand heat well, but all the rain has made them look a bit weedy… They could have done with some fertiliser too. Our compost had a starter fertilizer in, and since that they have had precisely one feed! Love the Elephant Ear. I don’t suppose it can stand direct sunlight in summer can it? The recent rains have been hard on my pelargoniums as well but when it’s hot and dry they can’t be beat. I sometimes think they are out of style around here and considered ‘common’ by some of the snobbier plantspeople but there are so many tempting new varieties and every once in a while I come across something with amazing foliage as well. I guess I’m saying I wouldn’t mind ‘concentrating’ on the myself, and I have been overwintering more and more lately! This particular elephant ear does well in full summer sun but I had to move a different one into a shadier spot. The shade lover is the more commonly found type which grows from those large bulbs which are sold in the spring while the sun lover is sometimes called the ‘upright’ elephant ear and has thicker, glossier leaves. I think all your pots are amazing, they look fabulous, what a lovely place to sit in the evening! I do love sitting out there at this time of year but it’s just been so hot and humid lately. Still I won’t complain, I’m so glad summer is holding on so well! Looks wonderful, but I understand that feeling where it’s just not what you planned. I rarely do containers but took the time this year. Started out great but now they’re spent. Probably should have fertilized them! Did your amaryllis bloom? The amaryllis bloomed over the winter and I’m letting them recover out there. So far they are looking good but there’s still a way to go before I bring them inside again. I think your deck is fabulous. Lovely choice of plants. What a great idea to paint the plastic pots. My pots don’ t get fed very often either. I think they should consider themselves lucky if they get watered regularly. Osmocote gives them a good start, but by August they good do with a bit of a boost, in an ideal world. Thanks, the deck is a nice place but it’s no Jetty garden! I’m wondering if I should have gone with a more interesting color for the pots but they are just pots after all and not everything needs to stand out. Everything on the deck is watered regularly via timer and drip lines, there’s no way it would still be alive without that. Considering how low maintenance it is it’s almost shameful how I can’t even be bothered to fertilize. 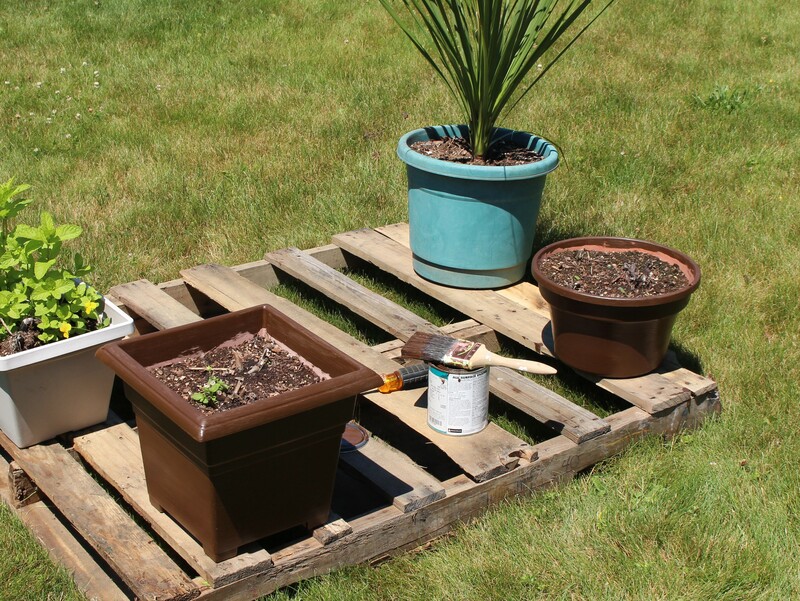 Great idea – painting the pots. I love the look. And as for your “Meh”, I’d be thrilled with it myself! Thanks Rebecca! I guess we’re always our own worst critics. Many of the pots are so old the plastic is beginning to crumble, and the paint covers a lot of sins. In some cases it might be the only thing holding some of them together! Well, I think “meh” is an unfair assessment, though I do understand the disappointment when things don’t look quite how you’d like. Some yellow would probably help the pinks and reds and oranges play more nicely together. I use little fertilizer spikes in my containers when I plant them, but they supposedly only last a month, and of course I rarely remember to put new ones in when its time! Osmacote sounds like just the ticket! Your Elephant Ear looks amazing! I need to show that picture to mine so it knows what it is supposed to be doing! I like that digiplexus, of course, but “meh” to its non-hardiness! Maybe it will self-seed? Yeah I don’t know what will happen to the digiplexis when temperatures drop. The most likely scenario is I’ll ignore it until it really gets cold, tell it I’m not going to take it in, rush out after dark one real cold night and dig it up, leave it sitting in the garage for three weeks, feel guilty and pot it up to save it, plant finally dies around end of February. 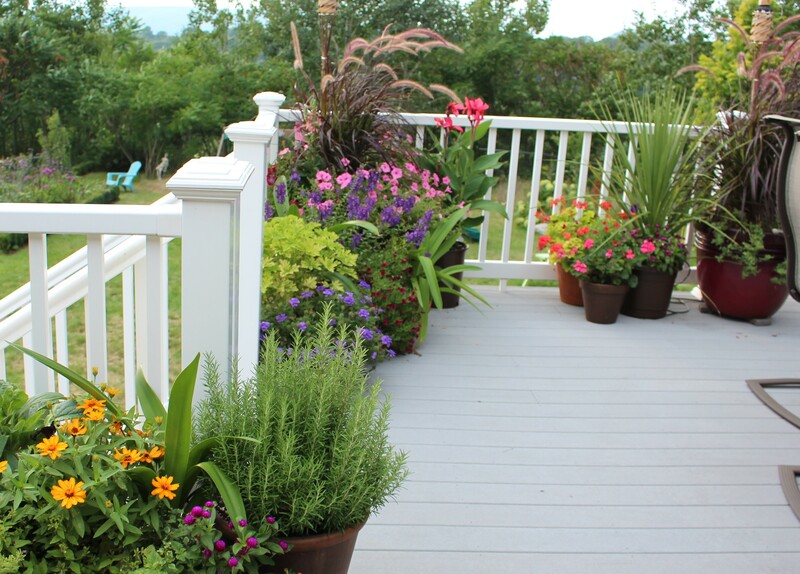 Frankly deck pots or any containers are such a lot of work that I think you get kudos just for doing it.I think it all looks great and very impressive esp. compared to my few pots. Your pots look wonderful! How did you keep them watered while you were on vacation? Did you hire someone? LOL to the chipmunk description! 😀 I once had a squirrel that was so mindbogglingly adept at circumventing any and all birdfeeder-protection measures that I named him MacGuyver out of sheer grudging admiration. Luckily here the squirrels often attract the attention of circling hawks, and that seems to be enough to keep them on their toes when out in the open (which most of my garden is). The cost of disposing of a stray squirrel tail still attached to spine (blech) is worth the safety of planted bulbs and fully stocked feeders… although they still get more than their share of seed.